This page is dedicated to the Societies that are IUPB members and wish to inform the international community of photobiologists of their activities and news. Information or documents (pdf) to be posted have to be sent to evelyne.sage@curie.fr and pino@vasarelli.it. 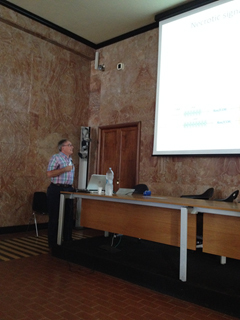 The Italian Society for Photobiology (SIFB), the French Society for Photobiology (SFPb), the Italian Group of Photochemists (GIF) and the French Group of Photochemistry, Photophysics and Photosciences (GFP2P) have joined their efforts and organized the first joint congress of the Italian and French Photochemists and Photobiologists. It held on 19-22 September 2016 at the University “Aldo Moro” of Bari, ex-Palazzo delle Poste, in Bari, the capital of the Italian region of Apulia, under the baton of Massimo Trotta. Photochemistry and photobiology are disciplines which are very much intertwined and such congress does fertilize the field. 160 researchers from the two countries attended the congress. The program included 2 plenary lectures, 13 keynotes lectures and 74 oral communications, delivered in 6 joint and 10 parallel sessions, and over 30 posters. Much attention was brought to Ph.D students, post-docs, who were funded by 40 fellowships and gave 39 oral communications. Jacques Piette, from GIGA, University of Liège, Belgium, delivered a plenary lecture entitled “RIP3 antagonizes a TSC 2-mediated pro-survival pathway in Photodynamic therapy-induced glioblastoma cell death”. Luisa De Cola, from Institut de Science et d'Ingénierie Supramoléculaires, University of Strasbourg, France, delivered a plenary lecture on “Seeing, understanding and controlling self-assembly of luminescent species’’. The 6 joint sessions covered topics on Optogenetics - Photochemical, photophysical and photobiological approaches in medicine and environmental science - Photoactive nanoparticles - Sensing and imaging - Devices and advanced material in photochemistry and photobiology - Artificial biomimetic and natural photosynthesis. The 10 parallel sessions included PDT and nanomedicine - Photodermatology and photoprotection - Molecular and cellular targets - UV effects - DNA lesions and repair - Photosensors and photoprotection in plants and microorganisms - Fast processes in photobiology - Photochemical synthesis – Photocatalysis – Photovoltaics - Computational photochemistry - Photophysical/chemical methods for cultural heritage. The Italian Society of Photobiology operating in Italy since 1974 (although in a different form collected the radiation biologists since 1952) by virtue of its first president Luigi Musajo. The Società Italiana di Fotobiologia (SIFB) is pleased to announce that the 2018 Annual Congress will be held in Udine from 20th to 22nd June 2018. The city is located in Northeastern Italy in the middle of the “Friuli Venezia-Giulia” region between the Adriatic Sea and the Alps very close to Austria and Slovenia. This particular area called ALPE-ADRIA allowed to extend the invitation to colleagues of Austria and Slovenia in order to improve the scientific collaborations. The Venue of the Conference will be Palazzo Garzolini di Toppo Wasserman in Via Gemona 92, in the heart of the city. Copyright © 2016 IUPB. All Right Reserved.